In celebration of Shopkins Season 5, now available for purchase, Moose Toys just announced the first-ever Shopkins Golden Ticket Hunt! Five golden tickets have been hidden inside Shopkins Season 5 2 pack, 5 pack and 12 pack. Find any of these Golden Tickets and you could win a once-in-a-lifetime Shopkins experience! Five lucky Shopkins fans and their guests will be sent on a trip to Melbourne, Australia where they will have the opportunity to tour the Shopkins headquarters. In addition, each winner will receive a Shopkins goodie bag valued at $500! The hunt has begun! Can you find the Golden Ticket? 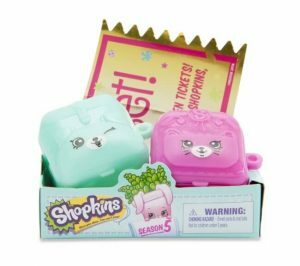 Beginning on August 28th, fans may purchase any Shopkins Season 5 2 pack, 5 pack or 12 pack in retail stores. Fans must look inside the packaging for a Golden Ticket for a chance to win. The odds of finding a Golden Ticket are 1 in 1,380,000. However, if you find one, you may redeem your prize by sending a photo of the front and back of your ticket to SPKPromos@MooseToys.com along with the unique code printed on the back of the ticket. Your email must also include your contact information. Alternatively, you may participate without purchase by sending a letter with your full name, address, city, state, and zip code to: Moose Toys Pty Ltd, PO Box 662, El Segundo, CA 90245, ATTN: Shopkins Season 5 Golden Ticket Hunt Entry. At the end of the promotion, a winner will be randomly selected from among all mail-in entries received. The Shopkins Golden Ticket Hunt is open to legal residents of the United States of America and District of Columbia. Excludes residents of Florida, New York, and Rhode Island. Participants under the age of majority in their state of residence must obtain parents’ or legal guardians’ permission prior to redeeming a Golden Ticket. The Promotion starts at 9:00 a.m. EST on August 28, 2016 and continue until all 5 tickets have been found. All mail-in Entries must be postmarked by September 17, 2016. The total approximate retail value of all prizes awarded during the Promotion is up to $30,000. For complete details, including Official Rules, visit www.shopkinsworld.com/goldentickethunt.